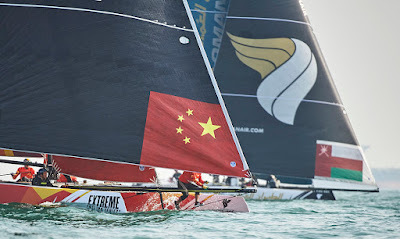 Qingdao today lived up to its reputation as one of the trickiest venues on the Extreme Sailing Series circuit as light winds limited action to just one race on the opening day of Act 2. 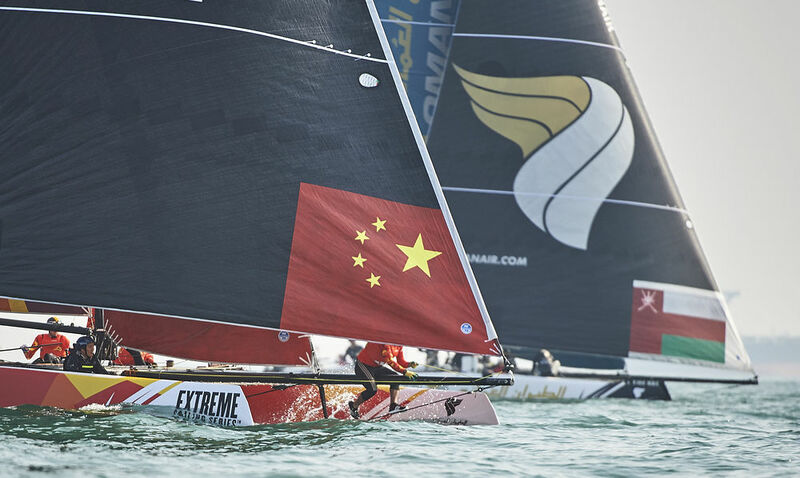 The Chinese city, hosting the Extreme Sailing Series for the sixth time, is well known for its ability to catch sailors off guard with a fickle breeze that can go from next to nothing to gale force in a matter of minutes. The eight-strong fleet took to the water for the first day of Act 2 expecting a brisk 20 knots of wind – plenty to get the GC32 catamarans ‘flying’ on their foils and enough to make controlling the cutting edge boats a challenge. But in typical Qingdao style the weather gods took a day off, and instead the crews were left trying to squeeze every last bit of boat speed from the gentle puffs of just a few knots floating in across Fushan Bay. The first and only race of the day saw defending Extreme Sailing Series champion Leigh McMillan steer his Land Rover BAR Academy crew to victory after pulling off an impressive mid-race comeback. 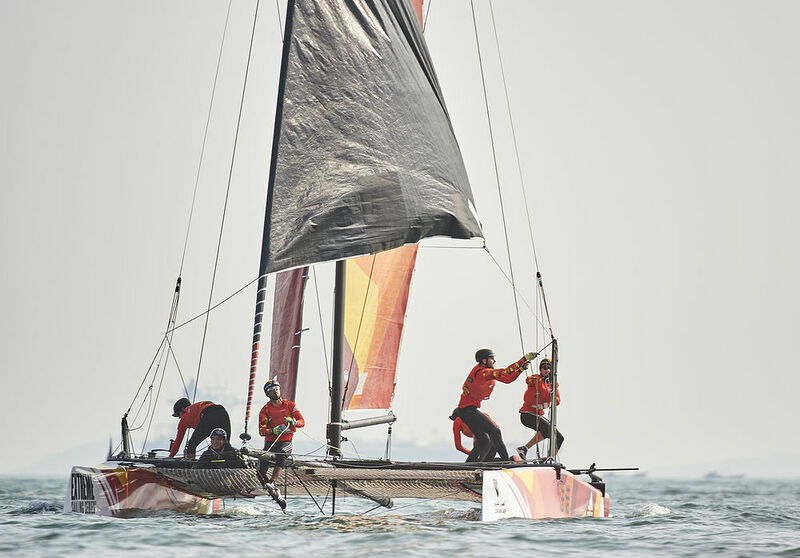 McMillan, who represented Great Britain at the 2008 Olympics held in Qingdao, started way back in the fleet but called on his vast experience of the fickle venue to reel in rivals Alinghi, passing them on the second lap to take the lead and the win. 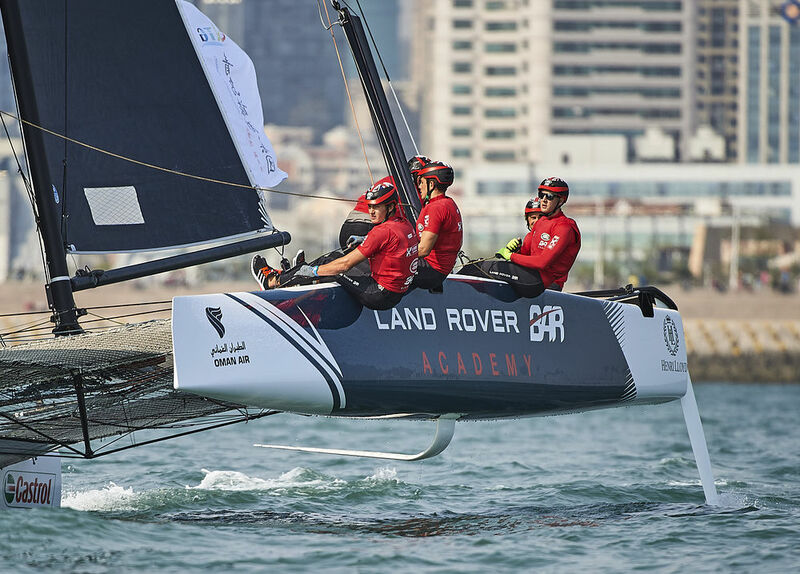 A second race was started but abandoned when the wind dropped to one knot, handing Land Rover BAR Academy the upper hand going into day two. However, tomorrow sees the race course move inside Qingdao harbour where the predicted 12 knots of wind will present an altogether different challenge to the crews, who are still learning to tame their super-quick catamarans. “Light shifty winds in Qingdao? We’ve been here before. 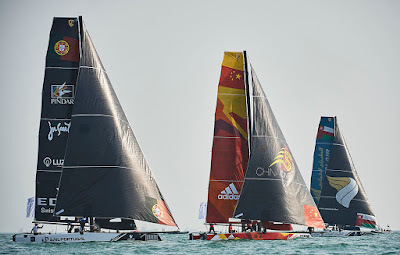 We’re obviously disappointed not to get more racing in but we’re looking forward to the next few days," McMillan said. 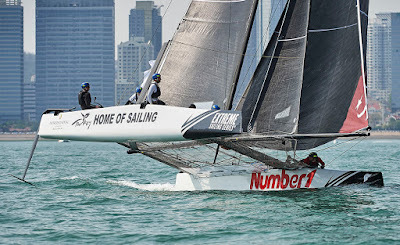 Oman Air, the regatta favourites after taking victory in Act 1, could only muster a seventh place finish in race one but skipper Morgan Larson remained upbeat at this early stage. “We expected it to be light today so we were mentally prepared but there was still a race which was challenging in its own right with lots of lead changes. Once again Leigh McMillan did nice work – I think he learned a lot over the years sailing on this course and he just read his notes this morning better than we did," Larson said. 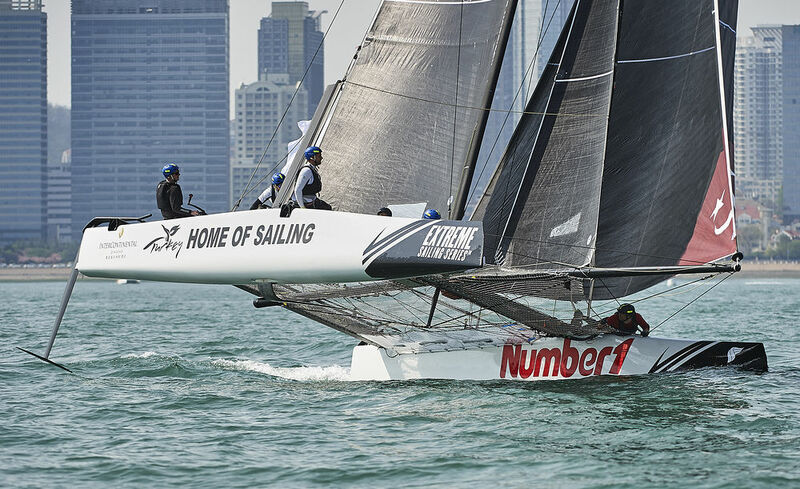 Team Turx skipper Stevie Morrison said with more breeze forecast tomorrow his crew were conscious of not getting lulled into a false sense of security by today’s lighter conditions. “If you get it wrong it could be a pretty high tariff,” he said. “We have to be realistic, and safety is our first concern. Three of our guys are new to the boat and so our job is to finish first, and to do that first you must finish,” Morrison said. 1. Land Rover BAR Academy (GBR) Bleddyn Môn, Leigh McMillan, Michael Barnes, Adam Kay, Neil Hunter 12 points. 2. Sail Portugal (POR) Diogo Cayolla, Bernardo Freitas, Javier de la Plaza, Luís Brito, João Matos Rosa 11 points. 3. 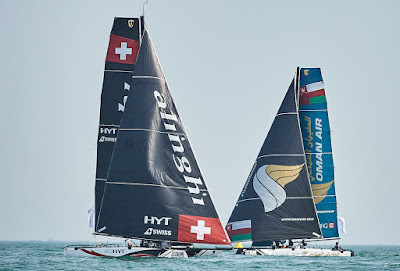 Alinghi (SUI) Arnaud Psarofaghis, Nicolas Charbonnier, Timothé Lapauw, Nils Frei, Yves Detrey 10 points. 4. 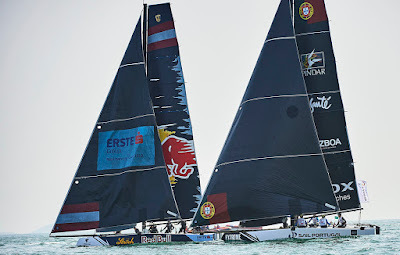 Red Bull Sailing Team (AUT) Roman Hagara, Hans Peter Steinacher, Stewart Dodson, Adam Piggott, Brad Farrand 9 points. 5. Team Turx (TUR) Stevie Morrison, Tom Dawson, Tom Buggy, Martin Evans, Brad Funk 8 points. 6th One (CHN) Taylor Canfield, Chris Steele, Shane Diviney, Hayden Goodrick, Luke Payne, Liu Xue 7 points. 7. Oman Air (OMA) Morgan Larson, Pete Greenhalgh, James Wierzbowski, Ed Smyth, Nasser Al Mashari 6 points. 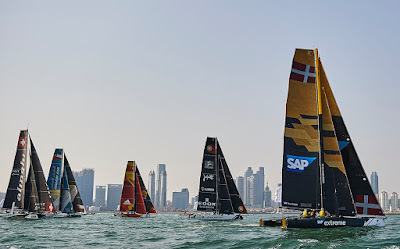 8.SAP Extreme Sailing Team (DEN) Jes Gram-Hansen, Rasmus Køstner, Mads Emil Stephensen, Pierluigi De Felice, Renato Conde 5 points.